Swift911™ is an emergency alert system that makes phone calls, sends text messages and emails to residents in the event of an emergency or for sharing important information. All the calls you receive will have the Caller ID of 'New Milford Borough' or 'New Milford Police Department'. *For individuals who do not have an email address, please contact the borough clerk's office and provide your home or cell phone number at 201-967-5044 ext. 5386. CrashDocs.org is an online service powered by Carfax. If you were in an accident or if you're an interested party, click here to get a police crash report in seconds. *Police reports may also be obtained in person by visiting the New Milford Police Records Department located in the main borough hall during the hours of 8:00 a.m. until 4:00 p.m.
♦ Overnight Parking Request Online Service - As of 10/03/18, residents will be able to request overnight parking online through our website! Click here to see how. The New Milford Police Department has joined the New Jersey Attorney General’s “Project Medicine Drop” initiative, and has installed a Project Medicine Drop box in the lobby of our police station headquarters located at 930 River Rd. Residents may visit the NMPD at any time, 24 hours a day, seven days a week, 365 days a year, to dispose of their unused or excess medications. Don't let your child's addiction start with you! Click here for the further information. Our new police department headquarters had its official ribbon cutting ceremony this past Saturday. In attendance were current and former members of the New Milford Police Department, New Milford's Governing Body, as well as many other distinguished guests. We are very appreciative to all those who attended and made this a very special event. During the ceremony, the police vehicle entrance way to the new headquarters was dedicated to Detective Lieutenant Brian Long, a dedicated member of this department who passed away in 2016. He will always be remembered by the NMPD. Click here for a few photos from the event. ♦ Prominently Display Your House Number - The New Milford Police Department would like to remind residents to properly display house numbers so they are clearly visible from the street in order for an efficient Police, Fire or EMS response. Residences without proper house numbers visible from the street have the potential to be issued a Borough Ordinance Summons. Any questions or concerns, contact P.O Michael Lafrano at the New Milford Police Department (201)-261-1400. 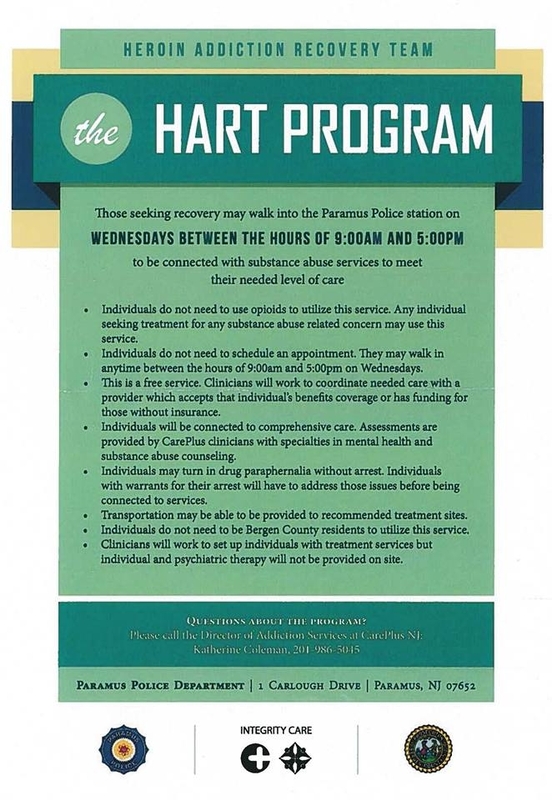 ♦ The Hart Program - Chief Frank Ramaci would like to advise residents of a new program being offered f or those individuals suffering from substance abuse. Prosecutor Grewal has recently announced a new initiative called the HART program (Heroin Addiction Recovery Team), which is in partnership with CarePlus, the Lyndhurst, Paramus, and Mahwah Police Departments. This is a walk-in program for those seeking recovery from substance abuse, and those individuals will be connected to comprehensive care. Assessments are provided by CarePlus clinicians with specialties in mental health and substance abuse counseling and they will work to coordinate needed care with a provider, which accepts that individual’s benefit coverage or has funding for those without insurance. Individuals may turn in drug paraphernalia without arrest, however individuals with warrants for their arrest will have to address those issues before being connected to services. The walk-in hours are Wednesday’s from 9a-5p. No appointment necessary, and you do not have to be a Bergen County resident to utilize this service. Transportation may be provided to treatment sites. 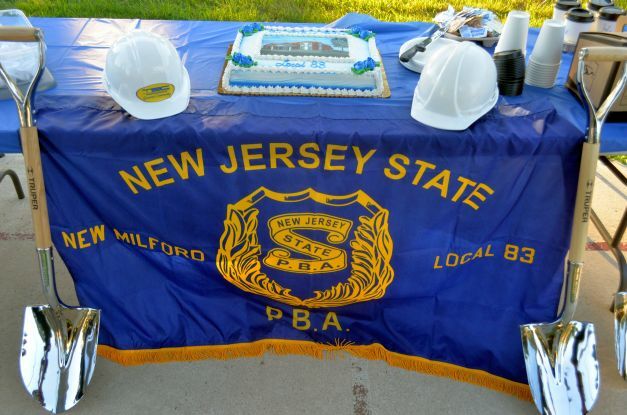 Click here or on the picture to the right to view pictures from the ground breaking ceremony for New Milford's new police station which took place on 9/12/16.